Alice Griffin shares the story of how she embarked on a travel adventure with her young family during the first two years of her daughter's life. Taking in Norway, Greece, France and Spain on the way, Alice weaves an inspiring travelogue with practical advice to help other mums and dads who enjoy interesting and authentic travel to continue with their baby or toddler on board. As well as sharing her own story Alice has interviewed other travelling mums to provide even more tips and personal experience. Inside you will find practical tips related to: essentials - important stuff like packing and passports; feeding - how to keep your baby well-fed without getting weighed down; sleeping - rest tips for bouncing babies so parents can still enjoy their holiday; Playing & Pacifying - things to take along to keep your child entertained on long trips; and, mobility - advice for taking your young children by plane, boat, train, bus and car. Whether you prefer to go off-the-beaten track to indulge your spirit for adventure, or simply want to enjoy a well-earned all-inclusive break, all the inspiration and advice you need is inside. Travel need not stop when love and babies come along! I've always loved the idea of travel. I'd like to go everywhere...really I mean everywhere. I'd like to go cross country and visit all 50 states. But then I'd also love to travel abroad. The Mediterrean has always held much fascination to me. I'd like to experience other lands and cultures. It's never been something I've been able to do. As soon as I was out of school, there was work, then marriage and then children...money was always an issue and so the idea was pushed to the back of my mind. When my husband and I discuss traveling it's always way in the future after the kids are grown. And that's kind of sad to me. I'd love for my children to be able to experience these things with us. I think that's why I loved this book so much! Alice Griffin decided while her daughter was still in womb that she wasn't going to let anything stop her and her family from their traveling lifestyle. She has an amazing outlook on life and I feel so blessed to have been able to read this book. 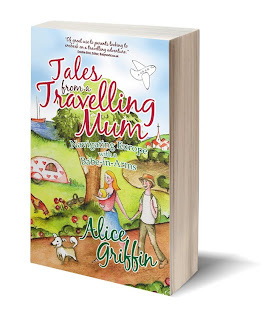 "Tales from a Travelling Mum is a refreshing book and makes an encouraging read for concerned pregnant women expecting their first child and all new mums and dads. You will laugh and empathize with the very real situations the family experience on their journey through life with a baby." "This inspiring and evocative book just goes to show that with a spirit of adventure, a touch of humour and more than a little bit of bloody mindedness, travelling with a baby can be a rich and exciting experience. If this book doesn't give you itchy feet and the confidence to travel with your brood then nothing will!"